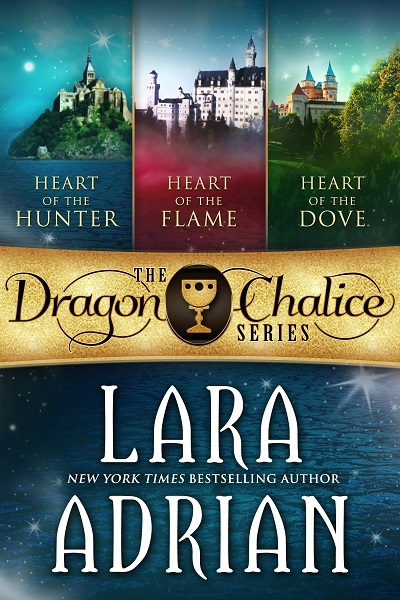 Digital boxed set of the Dragon Chalice series, a trio of award-winning, full-length historical paranormal romances from New York Times and #1 internationally best-selling author Lara Adrian (originally published under the pen name Tina St. John). This title is also available separately as a FREE ebook for a limited time. Also available now in paperback. Freed after six months imprisonment in an enemy's dungeon, former Knight Templar Kenrick of Clairmont is determined to find the Dragon Chalice, a mystical treasure rumored to grant its bearer unlimited power. He joins forces with an enigmatic beauty called Haven, risking all for a woman whose dark past could destroy them both. This title is also available separately in ebook and paperback. After the murders of his family, the only thing Randwulf of Greycliff desires is revenge. Vowing to use the dark magic of the mythical Dragon Chalice to destroy his enemy, Rand is unprepared for Serena, the innocent enchantress who stands in his way...and whose tender love might be all that can save his wounded soul.